This is second session of the picture making. 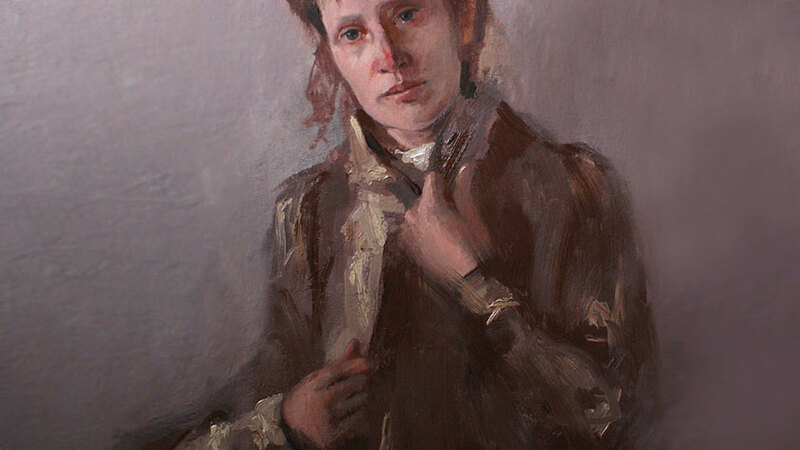 The first one was about the portrait, and now we are going to proceed with the sitter’s hands and cloths. The mixture of the brown paint had been prepared; this brown color is visually close to the color of the hair. With the help of a brush we’re making the outlines of the hands and clothing. The whole drawing is made with freehand brushstrokes. It’s not necessary to be over-precise on this stage. The approximate outline of the hands leaves you the freedom of expression. For this purpose the stiff brush will be the best for this purpose. 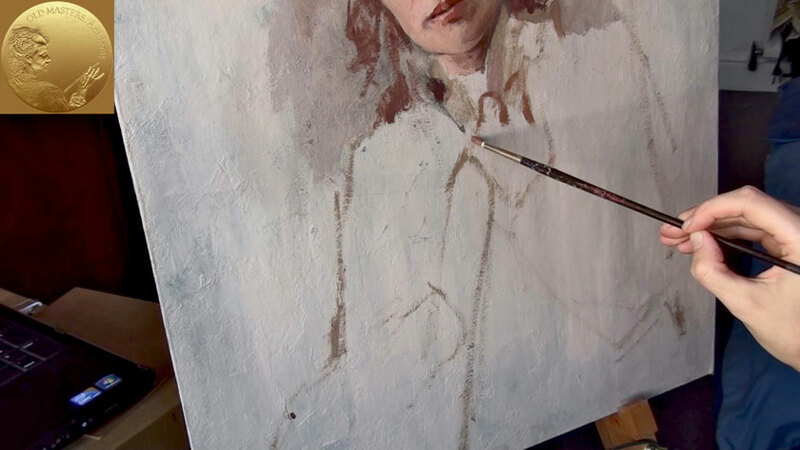 You can apply two techniques using the stiff brush: first – it allows to apply thick brushstrokes of oil paint and second, you can work with a semi-dry brush rubbing the paint into the canvas, which results in barely visible traces of a color. The background around of the figure shall be painted so that it overlaps the figure for about half-an-inch. 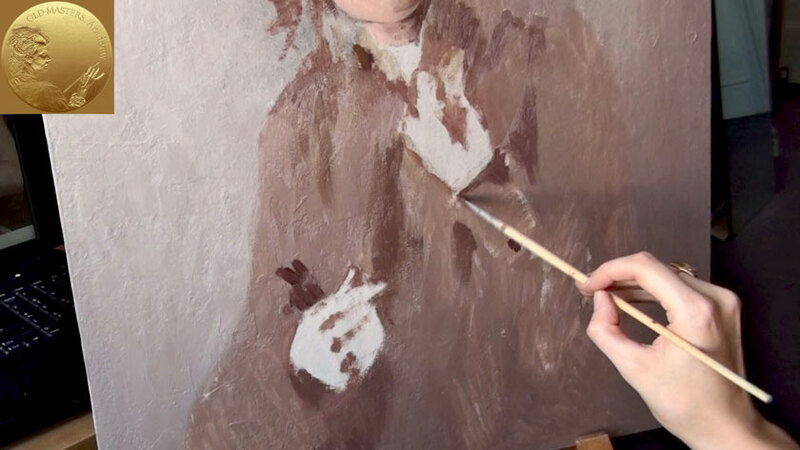 It is done deliberately, so you can use this overlapping border to smooth over the paint of the background with the figure, thus making the outline of the figure more gentle. The color of the background is not uniform. The transition gradual change from darker to lighter shades should be observed, though the gamut is the same. But one should remember that light tones substitute for the dark ones from the left top corner to the right bottom of the canvas. In order to paint the cloths we are blending the mid tone that will be worked upon to make it lighter in the highlights and darker in the shadows. We’re filling all the voids of the outfit with the mid-tone, leaving the area of the hands untouched. We are making the darker areas of the cloths with the spots of a darker color. if necessary we are mixing the borders between the mid-tones and the darker spots, making them softer. In the other parts of the canvas the borders remain sharp and contrasting. The dark-brown color is mixed for making the shadows. This deep brown won’t dim after it dries out. For this purpose we are using brown and intensely red paints: Vandyke Brown is used for the base with the addition of Burnt Sienna, and Alizarin Crimson. While painting the outfit we are also adding some other colors to enrich the nuances. For example the grey-blue is used for shadows, which adds cold colors to the outfit. This grey-blue is a mixture of Buff White, Ultramarine and Burnt Sienna. This mix is applied in a thick layer. The outfit is deliberately made thicker. It marks out the face of the sitter, that was made with the help of thin layers. It’s about time we continued painting the hands. First we’re applying the dark paint on the darkest areas of the hands. For the effect the same grey-blue color – the one applied for the shadows of the outfit is used. The flesh color goes nearby and the border between them mixes, so the colors are gradually passing into each other. The same paints are used for the second hand, though we are starting from the light areas to the darker ones, and mixing the border between the tones. Thus step by step we’ll be finishing the painting of the hands.